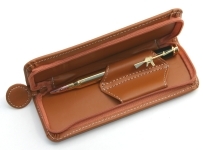 Pen presentation bag suitable for 2 pens, material tan coloured PU leather. An easy close zip is used to secure your pens once installed with their own leather strap. The flexible material allows the bag to expand to accommodate a larger diameter pen, dimensions 150x55x15mm. Show off your woodturning when for sale or as a gift. Pen not included.